TATS A KOOL CHALLENGE: Third Day of December! 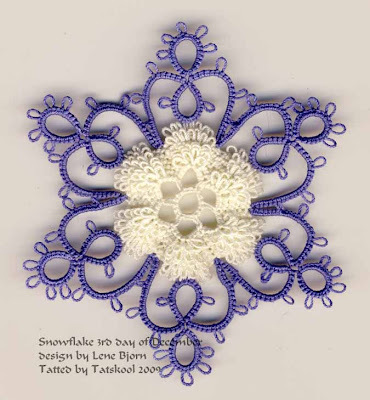 Another day, another snowflake....from 24 Snowflakes in Tatting by Lene Bjorn,but this time it's my absolute favourite in the book, so I tatted this lots of times and will tat it even more when I get the chance...why did I ever start this challenge!!! This is what I love to do, explore a pattern to the utmost! I started with a varig Altin Basak to see how much thread it would take. I have quite a selection of Altin Basak/Oren Bayen varig's that I rarely use as they are soft 3 cord threads. This was so pretty that I had to tat it again to send to a friend. It spurred her on to tat some herself! I felt that it would look good with a different thread for the middle, rather like a flower with fluffy stamens. These were made with Coats Floretta 20 in ivory and indigo, the first scan was with the scanner lid closed flat, and the second one with the lid propped up with pencils so that it didn't squash the fluffy center. The shadows really let you see the 3D effect. The thing that I like best about this design is the lovely 3D center. 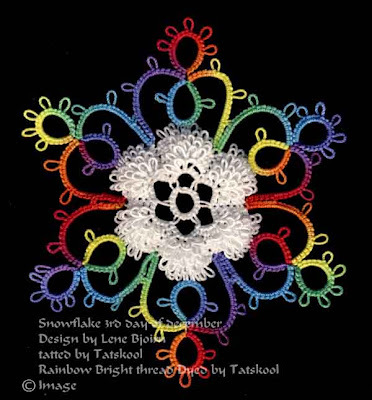 I also bought the book of Snowflake Roses by Denise Munoz, but not a single one has a fluffy center. That's a job for next Christmas to adapt those designs. Another one with a Floretta center in appley green with my Raspberry and Chocolate Mousse for the second round. Lovely subtle colouring. I didn't know if I was going to like this one until I got to the very end, and I do. It reminds me of a spring flowering Hellebore. I would like to try it using a slightly darker green for the outer round, even more Hellebor-ish. OK!! so you have all missed Rainbow Bright (well one of you anyway!) and so have I. This ABSOLUTE PERFECTION to me! ...of course you know me well enough by now to know what I am think...what would it look like with centers in all my Rainbow solid colours...yup you got it! I showed them to my friends to see if they liked the yellow center, as I was not sure it it was just too much. The white center is very classy I think. they thought that it tied in so well with the colours in rainbow Bright that it was a definate yes. That should keep you going! 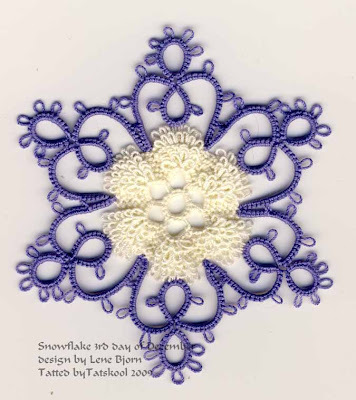 Now I know that there will be some tatters out there who think that it is OK to look at my tatting and figure out the stitch count so that they can tat it themselves. This NOT my intention and I thoroughly disapprove of this. It is not the way to encourage designers to keep designing for us. This book is such good value that the author deserves your support for all her hard work. If you like the designs, please buy the book, no I don't have any connection with the author or publisher, I just like fair play. See ya tomorrow!! or will I! HI Pamela! Fantastic!! I really like the fluffy center done in a different color. My favorite is the Rainbow Brite with the yellow center. Awesome!! Both you and the snowflake!!! 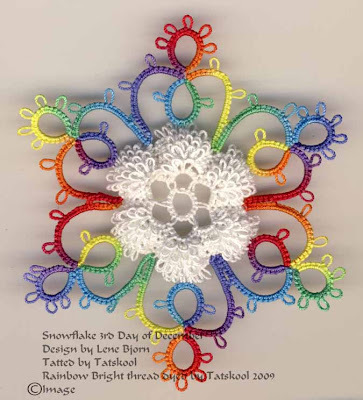 I'm really liking the snowflakes in this book, I may have to order this one. Is the book in English? Are the patterns done with written instructions as well as diagrams? Thanks Carol, The book is in the same series by Acacia as Inga Madsen's Tatted Animals and Iris Neibachs Tatted Doileys. If you have either of them or any of the others, Tatted Bookmarks, Tatted Easter Eggs etc, you will know what to expect. Just a diagram with minimum instructions. If you are comfortable with this you will be ok...usually! It is in English, but there are probably also copies in Danish I think...I have Tatted Handkerchiefs in Danish but it doesn't make a lot of diff as there is so little text. Great book well worth the tiny outlay. Wowza! That's an amazing pattern & you've done it justice with each of your snowflakes. They're so beautiful! OK, I'm off to find that book! LOL! What an amazing pattern. I have the book and need to venture out like you. LOVELY!!! DARN you. Now I'll have to go and see if I've got that book!!!!! Love them all. I don't like that soft Altin Basak thread either but the colours are tempting!!! I'm so glad you made that pattern. I did it a couple years agon and thought I was making a mistake because the rosette kept turning out 3-d. So know I know its supposed to be that way! Thanks, they look great! Holy Cow! You are one FAST tatter! You have also inspired me to pull out that book; I have not yet tatted from it. WOW. LOVE THE YELLOW CENTER. Of course, you know I am a rainbow brite addict. Love that colourway. I must get this book ~ it's the first one that has intrigued me at all. 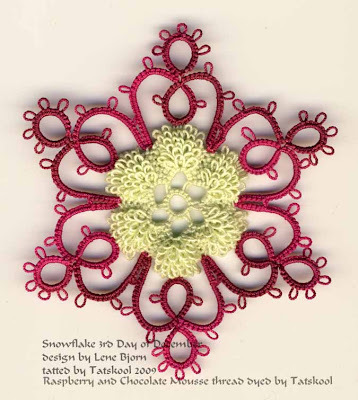 I bought the Munoz book because I wanted to practice the centers and the one with block tatting. but it it was able to be bumped up to 3-D, the patterns would really pop. Wow, they all look so gorgeous I really can't pick a favourite because they are all so different too. ARRRRG! I JUST bought a book of Christmas designs, which I do like, but I kinda with I'd gotten this one instead... I need to start a list! My favorite is the green center with Raspberry Chocolate Mousse. I love that 3-D center! My favorite is the one I have, of course! I love the way the last one looks. This is a bit like the Elves and the shoemaker; while I am sleeping, all these snowflakes appear! This is a gorgeous pattern, somehow it's one I must have overlooked because I just don't remember seeing it in the book. 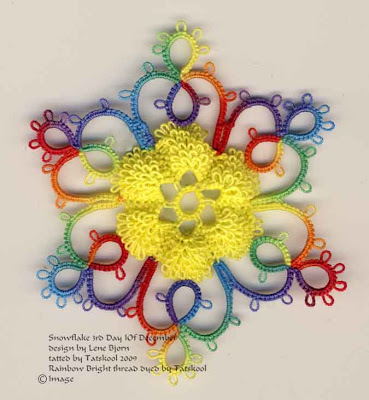 Every one of the snowflakes is stunning, but I'm with Bev - the yellow and Rainbow Bright is my favourite! They all are very pretty. I also really like the look of the Rainbow Brite and yellow centre. I may have to try that pattern as well. Woah! Love the snowflakes! Everyone of them! The centre's really interesting. Just look at the response you generated! And no wonder. Pamela, that is one beautiful snowflake! You are SOOOOO FAST! I have been eyeing that very one, since, I think it was Diane, tatted something from the book, which I have. But, this is the one I have been itching to do! It looks fabulous in the Rainbow Brite with yellow! And it is amazing on the black background! I love seeing the variations. Truly inspiring, as are all your posts! Magnifique! Merveilleux! 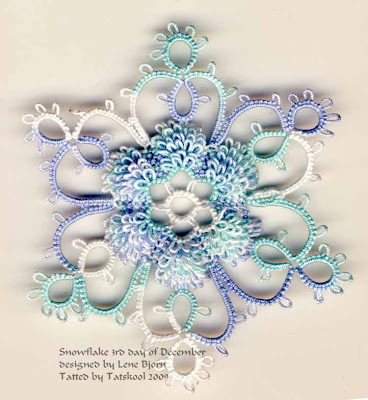 Wow and wow again, for the speed of your tatting and the beauty of the snowflakes. Each one is a triumph. Call me a fuddy-duddy, but I think my favorite is the white center. (I know I am in a minority.) The yellow is absolutely stunning, but there is a classic grace and elegance to the white. Both are winners! Hi Katie,Sunela, PaulaC...do try this book, hope that I am inspiring you enough. Hi Jane, I don't believe it! I don't inspire YOU! Hi Victats, I really don't know if it was meant to have a3D center , I just like it that way. Hi LSM, you have the book too, gosh, they are all coming out for an airing. It's amazing how many books we buy and never tat from. Hi Bev, I bet all the Snowflake roses would look nice like this. So glad you like the yellow. Hi Rayanna, nice to have you back again. HI Artylady, it's great when you like them all, i love to show how different things can look. They all looked ...well....just white in the book! Hi Ann, yoy are the first to say that you like this one. The book is such good value you can get it as well! I bought 3 snowflake books last Christmas and this is the first to get an airing...another one next Christmas!! Hi Diane, yup yours is a smasher, first colour that I picked. Hi Maureen, the elves and the shoemaker, well the Brownies do good things in the night too! Hi Jeff, another Rainbow and yellow convert, thanks for commenting. HI Val, glad you likey! HI Fox, yup the response has been phenomenal, the best yet. They are stunning, I think. Hope to continue to entertain you. Hi IsDihara, you are not a fuddy duddy, I still think the white center is the classiest...the others are more stunning tho...but the white goes on my tree first! Did you seriously tat all of those in one day? I am so jealous! Beautiful work! I really like this one and I like the combinations you put together. Of course the Rainbow Bright and yellow is probably my favorite though. Okay you've convinced me, I'm off to find myself a copy of this book. Hi Bonnie, Another vote for rainbow and yellow, now you will have to show me what you make. I just had to buy that book after seeing all your snowflake. Yours are all so awesome. I really like the ones that have a different color center. You did a wonderful job on all of them, very creative.